Get down and peace out, cause it’s all about the 70’s Tonight! Ahhhh yeah, the 1970’s. A time of music, love and peace. The clothes were tight, the hair was long and the vans were big enough to cart around twenty of your best friends. This 10″ cake was created for a 70’s themed birthday bash in the Twin Cities celebrating 1970 in a big way. A chocolate cake with a strawberry mousse, covered in colorful bursts of buttercream flower power set the mood. 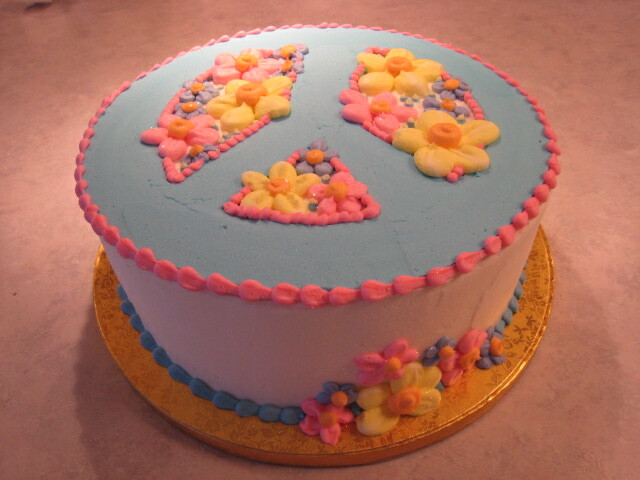 The peace symbol was a major icon of the 70’s and… well still is today! So ‘peace out man’ and ‘see you on the flip side!’. Wanna brush up on your 70’s slang? Check this out and be the coolest cat at the party! Everyone expects a turkey on thanksgiving day, but one covered in chocolate buttercream?! This turkey made it all the way to the Johnson’s Thanksgiving celebration and helped them celebrate two birthdays, making this day extra special! Happy Birthday Ian and Erik. 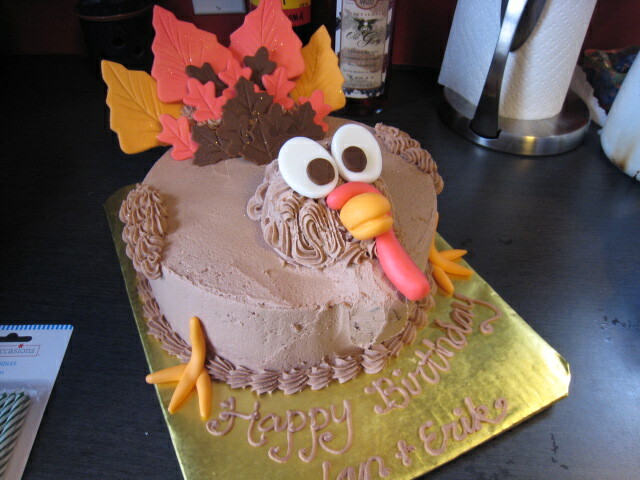 Hopefully you saved some room for cake, I mean turkey, I mean… turkey cake! 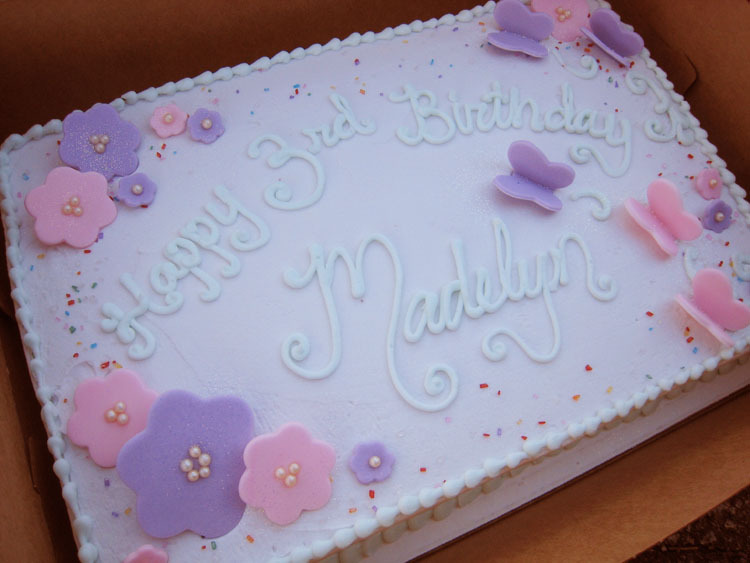 What could make a three year old more happy than purple butterflies, pink flowers and a cake covered in purple buttercream? Well, according to little Maddie, nothing could top that! She has a love for butterflies, which definitely showed when she was a Butterfly for Halloween! Having a birthday party the same day as trick-or-treating was quite a dream come true for this young lady. Her cake was a quarter sheet of marbled white and chocolate cake, topped with buttercream, candy crystal sugar sprinkles, fondant butterflies and flowers and the finishing touch.. lots of edible glitter! She blew out three purple, glittery candles that day. Something tells me this is going to be a good year for her! Tye dye, hairspray and slap bracelets are all icons of the ’80s, so when throwing an ’80s themed party, you better get back in touch with your to-cool-for-school side and dig out those boxes so you can rock out with your finest authentic ’80s attire. 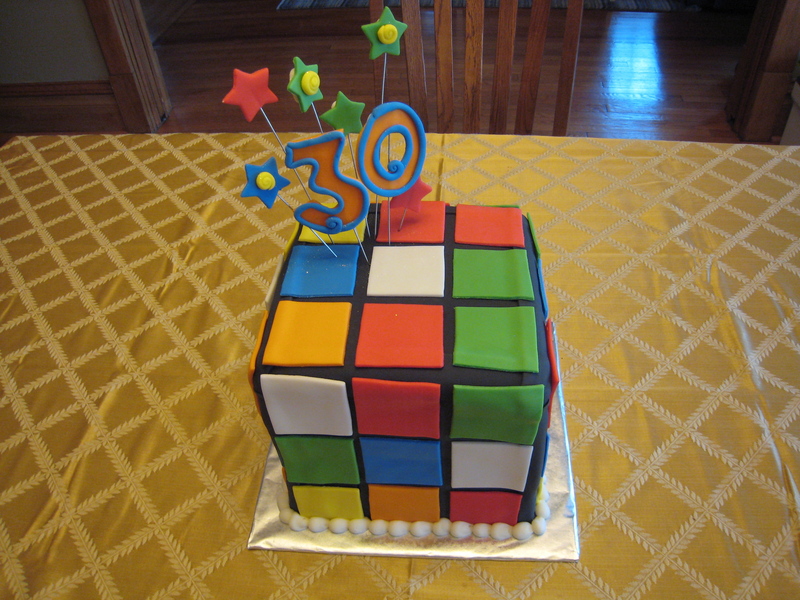 The inspiration for this cake was of course ‘the 80s’, but it was also about turning 30.. and we all know that turning 30 is a day to get funky town and celebrate! So how do you represent this wonderful decade and major life event with cake? Well, at first we came up with the idea of a disco ball, with sugar glass covering it, but that was a little more on the ’70s side… so we starting thinking of pop culture icons that defined those years best and of course, the Rubix Cube is one of those toys that we all puzzled over for hours, in between Rick Astley videos. So here it is, an 8″x 8″ Rubix Cube cake – four layers of marbled chocolate and white cake, each layer split with buttercream icing and covered in six bright colors of rolled fondant. Think that’s pretty sweet? Well, like… duh!! Sharing the spotlight can be difficult for a cake, as they are very often the highlight and centerpiece to any special occasion. Most people either display a cake or they choose to display a number of cupcakes, but rarely the both of them together, in perfect harmony. Well, I’m proud to introduce a new family member to the menu… the 4″ cake! 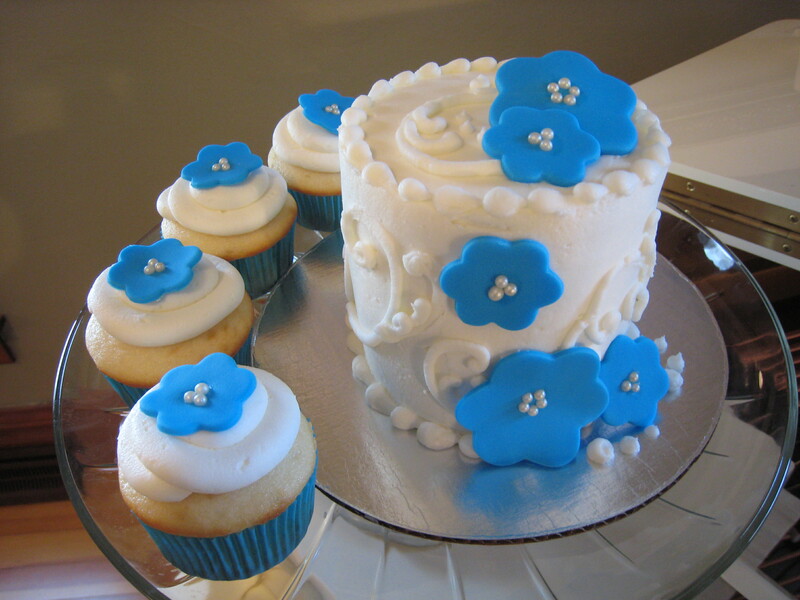 It’s the little sister to our 6″ cake and is much easier to partner with a few cupcakes to feed the same amount of guests! After all, we wouldn’t want any leftovers or seconds, right? What’s so great about turning 50? Well, you’re wiser, more respected in society, and you get to celebrate with a cake, literally covered from head to toe in black candles. Each one of those candles becomes a symbol of your life experiences, your goals reached and maybe one or two small regrets (the good regrets, of course). This cake was inspired by acknowledging that with age, comes sophistication, but at the same time, you better be ready to be called ‘OLD’ by your friends, family and especially your loved ones. The topper was made of Royal Icing. The cake was a tuxedo cake with chocolate mousse. 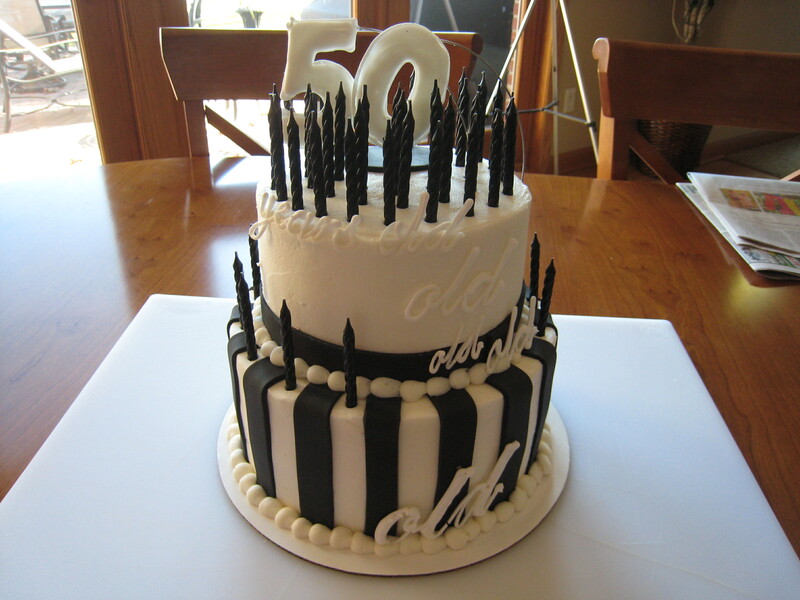 The base cake was adorned in black fondant pin striping, while the top cake was wrapped with a fondant ‘ribbon’. The top of the cake read ’50 years old’ and ‘old’, ‘old’.. ‘old’, trickled down the side of the cake as if to be implying that 50 was.. well, OLD. 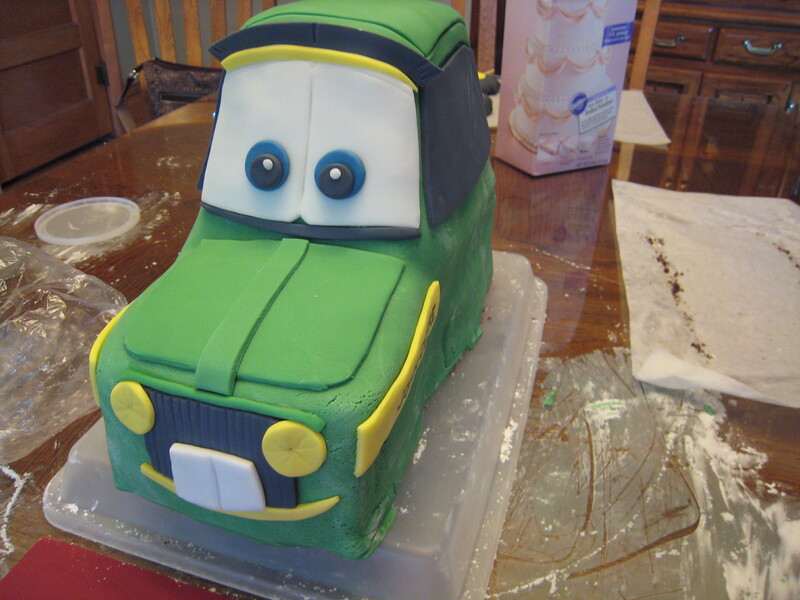 “Coolest” John Deere Birthday Cake, Featured on the Web! This week, Confectionery Cake Shop was proud to be featured on the ‘Coolest Birthday Cakes’ websites, where the artist talks about how they created their cake. It offers up some guidance and helps at-home bakers out there who would like to try to create it on their own. You can see for yourself (and try it for yourself) by visiting their website.